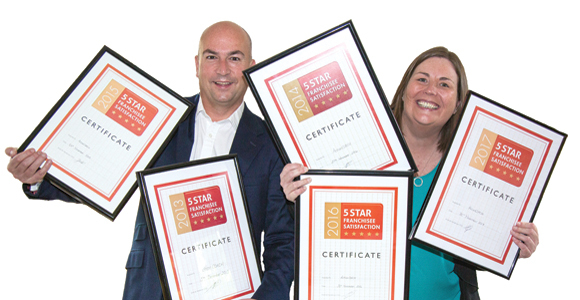 Ian Christelow and Julie Wagstaff, ActionCOACH’s UK Recruitment Director, celebrate five years of 5 Star Franchisee Satisfaction. Smith+henderson’s UK Franchise Satisfaction Survey has been adopted by over 100 franchisors since it started in 2011. Over 150 ActionCOACH Franchise Partners were invited to rate their franchise, its products, rewards and support. These outstanding results year after year make ActionCOACH one of just four franchises to receive a 5 Star Franchisee Satisfaction rating for five years. Ian Christelow, ActionCOACH’s UK Co-founder, explains: “These awards mean the most to our team because they are based on our partners’ feelings about our franchise. No matter how great your system is, if your franchise partners aren’t happy, then growth is not possible. The estimated total revenue generated by professional coaching in Western Europe was $898 million in 2015*. More than ever, there’s a huge need for business coaches to help companies secure meaningful growth and achieve their goals. Mitali Chopra (top right), a Franchise Partner since August 2016, said: “I chose ActionCOACH because I wanted the opportunity to build my own business and create impact in peoples’ lives, both in business and personally. “Within eight weeks of launching my ActionCOACH business, I had signed up five one-to-one coaching clients bringing in a monthly income that was close to eclipsing my previous corporate salary. The work I do is life-changing for my business owner clients. * Commissioned by the International Coach Federation (ICF) and carried out by PwC.